Ireland's Conor McGregor has been withdrawn from the Ultimate Fighting Championship's main event in July, just hours after tweeting he was retiring. UFC president Dana White did not confirm McGregor's retirement but said he would no longer be fighting Nate Diaz on the UFC 200 card on 9 July. White claimed McGregor was withdrawn for refusing to fly to Las Vegas for a news conference and promotional photos. Last month, Diaz became the first man to beat McGregor in UFC. In a tweet posted on Tuesday, McGregor wrote: "I have decided to retire young. Thanks for the cheese. Catch ya's later." The 27-year-old's coach, John Kavanagh, added: "Was fun while it lasted." Many mixed martial arts fans on social media reacted to McGregor's message with shock but others expressed doubt he was really planning to quit. Diaz responded to McGregor's comment with a tweet of his own: "I guess my work here is done. I'm retiring too." 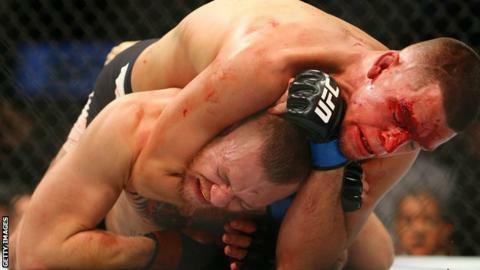 The American, 31, beat McGregor by choking the featherweight champion into submission. McGregor was previously unbeaten since signing to UFC in 2013, with career earnings in excess of $2.8m (£1.94m). He has made significantly more in sponsorship and promotional work. On Monday, McGregor posted pictures of himself training in Iceland before his rematch with Diaz. However, just a week ago, he issued a statement talking of his sadness following the death of Joao Carvalho after a fight in Dublin. "It is such a rare occurrence that I don't know how to take this," McGregor, who watched the fight from ringside, wrote. In an interview with ESPN, White attempted to clarify the situation, insisting McGregor was obligated to come to Las Vegas to promote UFC 200. "I respect Conor as a fighter and I like him as a person, but you can't decide not to show up to these things," he said. "He's in Iceland training. He felt leaving right now would hurt his training, but every other fighter on the card is coming."